Today's nails were inspired by a readers mani, which she sent me a photo of and link to her flickr account. 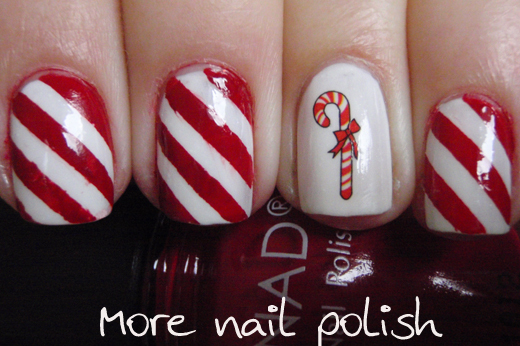 scratchureuesout did an awesome candy cane mani in red and green and then put a spectraflair top coat over it. You can check it out here. 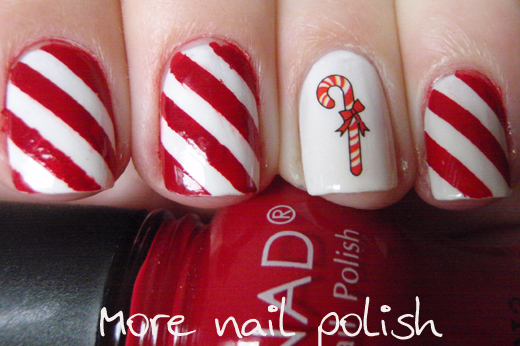 She inspired me to do candy cane nails. I haven't got around to adding the spectraflair top coat to it yet, I will do that tonight and photograph it again to add to another post later. I used some fancy striping guides to get the nice even lines, then I used Konad special polish in red and painted some polish on the glass table top. I then dabbed the stamped into the polish to cover the tip, let it dry and then rolled it over the nail. It gave it a nice thin smooth coverage of polish and the tape came off without any bleeding. 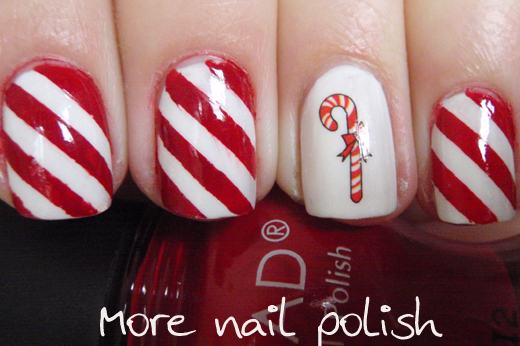 The feature nail is another water decal from the "Fing'rs Holiday Nail Art Decals". Oh, and how to you like my little nubbins. These are the shortest I've ever posted on my blog. 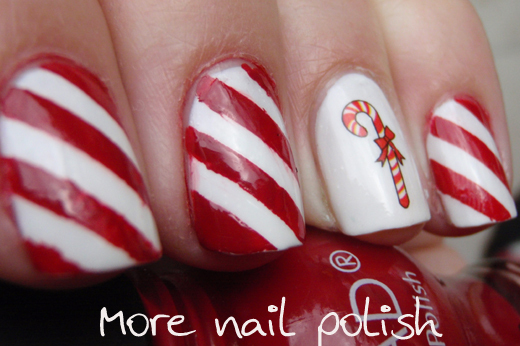 that really looks like candy cane...beautiful! Your nubbins are marvelous. I've thought of going short. I would use less of my expensive and retired polishes ie. CG OMG. I think that some bloggers do shorties for speed of swatching. Thanks for giving me credit. I feel like a super star. Your application proses was smarter than mine. I cut my own tape. It took forever. The water decal is brilliant. Happy holidays.